The global economy appears to be headed over cliff this year. The emerging world is experiencing a significant economic slow down, the Eurozone will probably break apart in the next few months, and the United States faces sharp austerity measures at the end of the year. There are enough bearish developments here to make the original Mayan calendar look prescient after all. So should we despair? 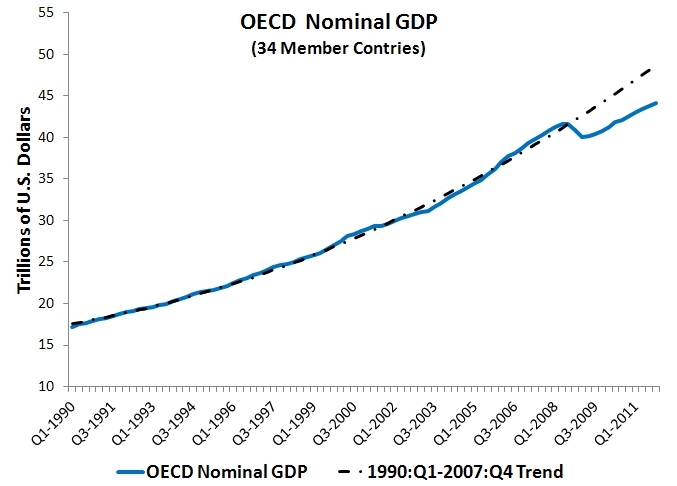 Is the global economy fated to collapse in 2012? The authors say the best of these options is (ii) and (iii). These are radical proposals that would require both monetary and fiscal collaboration, but right now radical solutions are exactly what the world needs. The global economy needs a jarring slap to the face to awaken it from its heightened risk-averse stupor. These proposals would most likely do it, but they lack an endgame. How much imaginative QE and helicopter drop money should be done? This is an important question, because without an endgame to drive market expectations, these measures will be less effective and have the potential to unmoor long-run inflation expectations. And, as Kelly Evan notes, monetary authorities are loathe to simply try something without some guiding objective. Enter a nominal GDP (NGDP) level target. It would provide an explicit endgame for the policymakers as they implemented these imaginative QE and helicopter drops. This would not only keep inflation expectations anchored, but would create the incentives for investors across the globe to do much of the heavy lifting required to restore robust global aggregate demand growth. For example, imagine that monetary authorities in the United States, Europe, United Kingdom, and Japan simultaneously announced they were going to engage in as much imaginative QE and helicopter drops necessary to restore NGDP to some pre-crisis trend. How do you think markets would respond to these announcements? It is highly likely that the mother-of-all portfolio adjustments would take place, with investors across the glove moving into riskier, higher-yielding assets in anticipation of higher aggregate nominal spending. This would raise asset prices, lower risk premiums, and create a self-sustaining recovery. It really is not that hard. [S]overeign central banks have the means to defeat any depression thrown at them by launching mass purchases of assets outside the banking system, working through the classic Hawtrey-Cassel quantity of money mechanism until nominal GDP is restored to its trend line. I hope policymakers prove him wrong. The chart you display shows NGDP on a fairly consistent upwards trend of around 5% a year apart from a sharp drop in 2008. The Market Monetarist story appears to depend up the fact that this NGDP drop from 4 years ago is still driving low AD in 20012 despite the fact that that NGDP has increased steadily since that time. MMist propose a NGDP target of 5% based on the idea that inflation expectations are around 2% and productivity increase around 3% a year. Since 2008: Inflation has averaged less than 2% a year and wage rate inflation has been somewhat lower than that. Even assuming (and this seems a stretch) that productivity has increased 3% pa since 2008 it seems odd that RGDP has increased as slowly as it has since if the reason for the original fall in RGDP was purely deficient demand. The data seems much more consistent with a supply-side shock in 2008 which hit potential RGDP from which the economy is slowly recovering and which various attempts to boost "recovery" via monetary and fiscal policy have therefore led into a cul-de-sac. It concerns me that if indeed potential RGDP was reduced in 2008 that the expansionary policies recommend in this post will likely simply add inflation into the mix (albeit inflation that is "bounded" by the NGDP Target) and this inflation will then introduce further pricing distortions into a already stalled recovery process. Yes, it looks like to me NGDP is back on track after its surge during the boom's burst. You would be better off increasing government purchases into some real fixed investment that could actually create some jobs. Looks like to me, NGDP targetting would blow another bubble sky high in finance without improving the real economy one iota. "[It] seems odd that RGDP has increased as slowly as it has since if the reason for the original fall in RGDP was purely deficient demand. NGDP back on trend? On what basis do you make that claim? This is not a question of reaching the previous peak, but of returning to the path of NGDP expected by the public prior to the crash. Even if one accounts for the housing boom period NGDP is still well bellow any reasonable trend. Anonymous, a better argument is not that NGDP has returned to trend (it has not) but that potential GDP has fallen thus nullifying the previous pre-boom trend. Here too I think the evidence is scant. Alas, David, it appears Draghi says that the ECB will not keep Greece in the Eurozone "at any cost". What I would give for them to hit their absurd 2% target, much less go for something like NGDP! Dave, you cannot tell me that the current nominal spending rate is out of line. It clearly is back toward its trend after the boom. Nominal spending is not the problem. There is plenty of income to tap into. The problem is that deleveraging isn't over and debt is still clogging the system. Your NGDP targetting would just fill financial coffers while leaving the real economy to rot. It wouldn't help with deleveraging a bit. Now, I don't agree with cramdowns. The currrent pace of deleveraging is fine. But outside a increase of government real fixed investment, I don't see anything that would help other than just letting the process play out. America is fortunate to be in the position it is compared to the rest of the world. We get easy financing on our debt making borrowing easy compared to everybody else, which has led toward a recovery better than everybody else, unremarkably. America's self-loathing bitterness amazes me. I can envisage 2 scenarios. Scenario 1. An increase in the demand for money causes the volume of transactions in the economy to decline and a recession. This should cause downward pressure on prices and be relieved by either prices actually falling or by the money supply increasing in response to the increased demand. However prices have not really fallen much since 2008, and despite fairly large increases in the money supply economic activity and RGDP remain low. Scenario 2: A busted boom causes some major changes in the structure of demand not just for money but for other goods as well. As a result the new equilibrium level of RGDP falls sharply and brings NGDP down with it. RGDP will stay depressed until supply slowly changes to match the new structure of demand. In this model increasing the money supply will just cause a combination of temporarily bringing RGDP above equilibrium and inflation. The second scenario seems more in line with what has happened. Boosts to the money supply have given a short term lift to the economy and caused asset price inflation. Then things has fallen back. This is not what I would have expected if the underlying problem is that demand for money itself is too high - in this case every increase in the money supply should lead the economy towards recovery and these changes would not be reversed out when the stimulus goes away. I think the first article you link to supports my argument. The businesses complain that lack of demand is holding them back. Is this not true of all businesses at all times ? Could they not increase sales by cutting costs (after all it a buyers market) and thereby reducing their prices? The fact that they don't is indicative of the fact that we are in a situation where equilibrium RGDP is simply lower than during the boom years. This is driven by supply side rigidities that cannot just be wished away by increasing the money supply. During the "great moderation" policies that were indistinguishable from what market monetarists are proposing were the norm. This led to unsustainable debt levels, a bubble-driven economy and a huge crash. I think we need to analyze the reasons why this happened before prescribing more of the same medicine. I agree that deleveraging is a drag, but only because the Fed has failed to maintain nominal income at its pre-crisis expected levels. The debt overhand exists, in part, because nominal incomes are far lower than expected when nominal debt contracts were signed. Delevarging is also a symptom of an excess money demand problem. In short, deleveraging is a symptom of a deeper problem that can be fixed by monetary policy. (1)Inadequacy of a balance sheet recession. Prices have not adjusted as you note, but the money supply has not returned to the level that meets the excess demand for it. It is true that M2 has increased in response to excess money demand. However, there is still excess money demand. To see this one has to look beyond M2 to a broader measure that better reflects the total stock of assets that are now used as money. M2 can be thought as representing retail money assets used by households and small firms. But there are also institutional money assets that include such things as repos, commercial paper, treasuries, GSEs, etc. These are still in short supply relative to the demand for them. This is the "safe asset shortage" problem. Read the below links for more. Regarding this comment: The businesses complain that lack of demand is holding them back. Is this not true of all businesses at all times? Look closely at the figure again. Note that only lack of sales rises and it does so significantly. So no, businesses do not complain about lack of sales at this level all the time. Moreover, if your structural story were true one would expect to see the other series (regulation, labor quality, etc) soar too. I will need to spend some time studying up on Divisia to understand how that is relevant to the discussion. With the inflation that is factored into an NGDP target would MMist not have expected that in this 3 1/2 years of reasonable NGDP growth that some of the price rigidities that caused the original recession would have got resolved ? Or am I perhaps mis-understanding the program somewhere ? if you look at (for example) the NFIB survey, it is not true that at all times companies say lack of demand is the #1 problem. During more normal times it can be things like lack of qualified labor, regulations, etc. I think that's a good observation. the main rigidity as David points out is balance sheets. These are far more rigid than wage contracts (for example, nationwide in the US a home stays in foreclosure for 700+ days). It takes far longer to reset them in aggregate. On "Moreover, if your structural story were true one would expect to see the other series (regulation, labor quality, etc) soar too." I don't necessarily think this is true. Here is an example. Industry A employs a large % of the workforce at a wage above the norm for the economy. Something happens that causes the demand for A to fall dramatically. The supply curve for A is vertical so the price for A stays the same but the qty falls significantly. The supply of labor for A is also vertical so wages stay the same but employment falls. As employment falls so does AD in the economy leading business (in A and elsewhere) to complain about lack of sales. This is not caused by an increased demand for money though but by supply rigidities in industry A that were there all along but hidden. It seems to me that the accounts here are not incompable. The bust in 2008 invalidated a range of economic activity - not just construction employment (which Krugman likes to focus on) but housing investment, financial intermediation and boom retail. Because of a lack of recognition and liquidation, some of the zombie investments associated with these activities (non-performing mortgages, unfinished condos, excess furniture retail etc) persist and inhibit new investment. Money is a safer bet, hence the demand for money is elevated, but since central nowadays (unlike in the early days of the Great Depression) supply money freely, that need not mean that there is excess demand for money, hence there is no deflation. Now I don't doubt that you can get out of this situation by a flood of money that lifts all boats, but it seems to me that expediting recognition and liquidation would tackle the problem at source. There are many commentators who associate liquidation with morality, fetishism etc, which I think blinds them to the possibility that liquidation is a precisely targeted solution which minimises collateral damage.